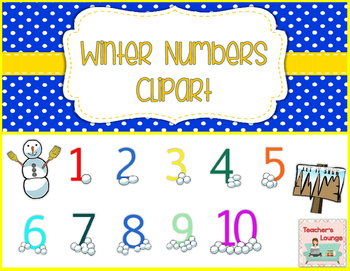 Numbers 0 -10 in a Winter Theme. You may use these images for commercial use, including in your TeachersPayTeachers products. However, CREDIT is REQUIRED and images must be secured. *You cannot sell my graphics as is and claim as your own. All copyrights remain with Teacher’s Lounge. All rights reserved by designer. This product is to be used by the original downloader only. Failure to comply is a copyright infringement and a violation of the Digital Millennium Copyright Act (DMCA). Clip art and elements found in this PDF are copyrighted and cannot be extracted and used outside of this file without permission or license. Intended for classroom/personal/small commercial use ONLY.